We don't see a whole lot of movies about female soldiers. If we do, they're often service pieces in the form of documentaries or tucked away in a time capsule of films we rarely refer to these days (Private Benjamin, G.I. Jane, etc). For some reason, they're just not cool enough to be included in frequent film conversation. Even more interestingly, we often view them as a group of women defined by what they do rather than who they are individually, which distances them from the audience on a personal level. This is why ZERO MOTIVATION is so refreshing. It's not a movie about female soldiers, the injustices they endure in their units, nor does it push a girl power agenda. Actually, it subtly turns its nose up at the new feminist regime era that begs women to be universal role models. The women characters in this film, which premiered at the Tribeca Film Festival this week, are unapologetically aimless. But they're relatable to many people in corporate America today. They do their jobs because it's their jobs and that's that. Not because they like it or because it fulfills them, but because it's there and they might as well. But at the time we meet them in the beginning of the film, they've had it. Like, they're not even trying. Tired of being overworked and underappreciated, our two Israeli protagonists--Daffi (Nelly Tagar) and Zohar (Dana Ivgy)--have only been known for their expert paper shredding skills. Which means exactly how it sounds; they handle the office supplies and shred the sensitive documents in bits and pieces. Oh, they are also really good at making coffee and delivering it to their male counterparts in the big board meetings. If women are somewhere Leaning In, they're not interested in it. In fact, they're so weighed down by their lack of progression that it is only their shared apathy that keeps them entertained. While Zohar is wallowing in complacency, which has turned her into a spiteful worker bee, her best friend Daffi decides to take matters into their own hands. She may not be ambitious or particularly useful as an office rat (she and Zohar spend more time trying to get to the next level of MindSweep than doing their actual jobs), but she is determined to transfer to Tel Aviv where she can escape her tyrant boss and all her problems will go away. But what she doesn't realize is that her problems aren't location or job specific. It's her. Like Daffi, her boss (who's also a woman) is trying to move on from the triviality of her job but bumps into her own roadblocks along the way. Obstacles that make them question whether it's even worth it. Why try to get ahead when every move seems to end up unilateral? Further, moving forward just seems to be a means to go somewhere else and be unhappy. Where can you go to hide from your own misery? For Zohar, it means dealing with it, allowing the resentment mount until she begins to make her lash out at Daffi for bothering to do something about her circumstances. If they can't at least be in this together, then what else do they have? At its core, ZERO MOTIVATION is about friendship and office survival among women who can't seem to muster the ambition to see beyond their current situations. 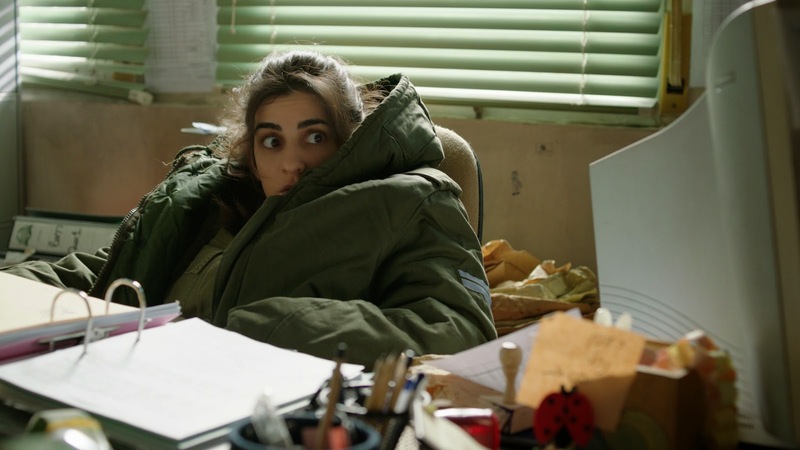 First time feature writer/director Talya Lavie impressively creates a witty and tangible dramedy about working women hampered by their own stagnation. Known for her short films, Lavie divides this dramedy into three chapters, which is an artistic decision that isn't actually necessary as it seems to only be there to offer the audience thematic guidance. With the humor of Office Space and the malaise of a Pedro Almodóvar piece, ZERO MOTIVATION is surprisingly engaging and a great first effort from Lavie that introduces the dazzling talent of a relatively unknown female cast to a wider audience. I wanted to see this but it was sold out - glad you liked it! There's an old Israeli military proverb "in the army everything is devided into three". and this movie is no exception.